From 2007 to 2013, the VSF network run two subsequent EU funded projects to raise awareness on small scale farming in relation to food security and climate change. This three-year project, starting in March 2007, aimed to raise awareness and inform the European citizenship about the key role of small scale livestock farming in the South and their important contributions to food and nutrition security. The project was implemented by a consortium composed by AVSF, VSF Italy, VSF Belgium and VetAid, who developed messages and tools in collaboration with with their Southern partners in Brazil, Haiti, Mali, Niger, Tanzania and Iran. These tools were meant to be used both in Europe and in the other countries involved, in order to maximise the impact. In the targeted European countries, the project put big efforts in sensitization of students from Agriculture and Veterinary faculties and institutes. These groups proved to be very interested in learning an alternative approach to small scale farming as a mean for fighting poverty and ensuring food security. The second EU-funded project project run jointly by VSF members has been active between 2011 and 2013. The project had a strong social networking component, aiming at fuelling debate and exchange among livestock people. Small Scale Livestock Farming was still at the core of the action, with a particular focus on Climate Change. The action was designed to offer to key target public and EU society new tools and inputs for questioning the current mainstream ideas spread about livestock and its impact on climate change, and thus to recognize the specific role of small-scale livestock farming in relation to poverty alleviation, food security, health and environment, in the South as well as in the North, in a global view encompassing sustainable development, solidarity between peoples and Food Sovereignty. The goal of the project was to make small scale livestock farming (SSLF) recognised in its role of facilitating adaptation of vulnerable populations to climate change and its mitigation, and to contribute to the consideration of SSLF specificities in (political) debates and climate negotiations. 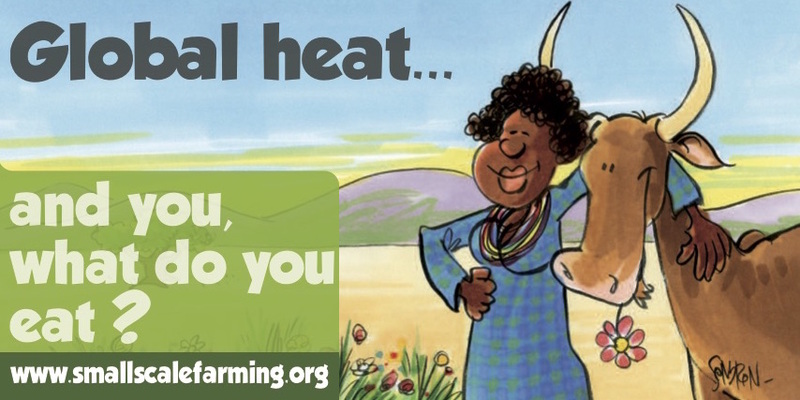 Video: Let’s MEaT Responsibly, Small-Scale Farming is the key!